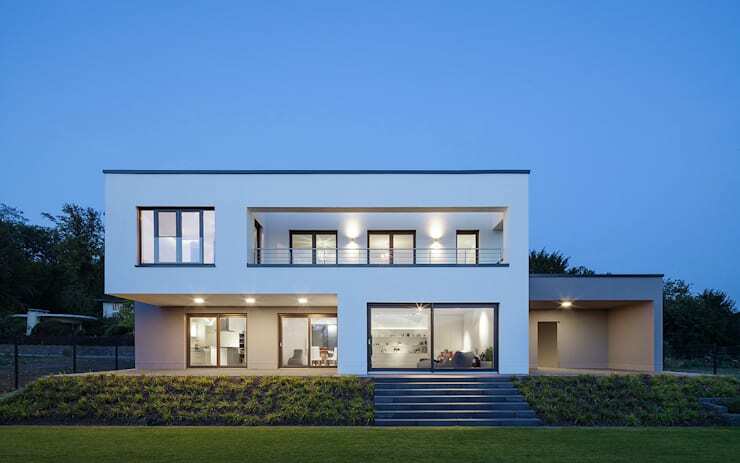 A major trend in modern houses in the minimalist designer look of the interior and exterior living spaces. The large homes are often elegantly decorated with large windows and doors, creating natural illumination within, with sunlight pouring into the home and perfectly warming up the inside throughout the day. Modern homes focus on functionality and practicality of a house as a space for a family, guests and foot traffic and with the use of neutral tones and materials, a home such as this will be classic and tasteful for many years to come. The fantastic team at Skandella Architecture has ensured that they met the brief and design specifications of the owners perfectly, making this home a design classic. 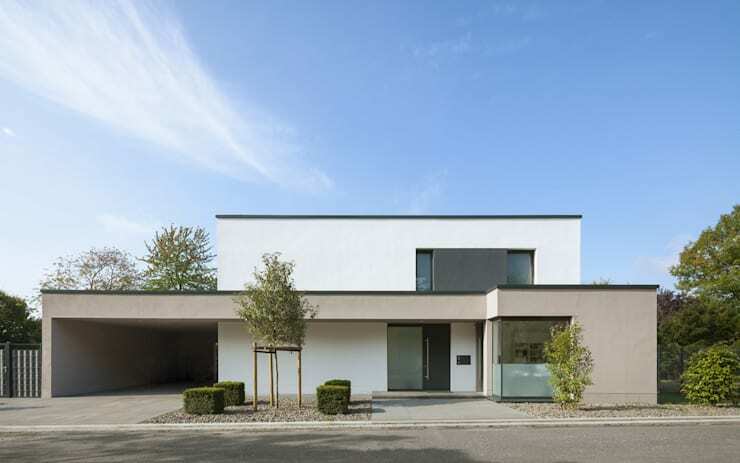 The contemporary design and modern exterior of this home is minimalist and fabulous in every possible way, making the classic and neutral tone and colour of the residence a perfect fit for the neighbourhood and landscape. The home has been inspired by Bauhaus and sees two cubes creating a double storey feature that is sculptured and almost carved out of stone. The incorporation of the garage at ground level creates a unique space to house the cars within the home with adequate driveway space and street parking for all guests and visitors. This home has modern design and comfort in mind throughout its classic style and architecture. Viewing the ultra-cool cube home from this angle creates a different perspective, a creative dynamic that showcases the variation in design and open spaces, making it a true attractive living space. The flat-roofed home is stylish and contemporary in every possible way and is not shy about its appearance. The living room of this fantastic cube home is neutrally decorated with all white walls, ceilings and floors as was seen on the exterior of the home, but that doesn't make the home bland and boring… in fact the simple use of colour allows the splendour of the home itself to shine through and become the attraction that the designers and owners had in mind. The simple decoration, coupled with the minimalist fireplace that is eco-friendly too allows this home to be fabulous, welcoming and inviting. And with new age incorporations such as this fireplace, the home is sure to be cosy and relaxed living area too. 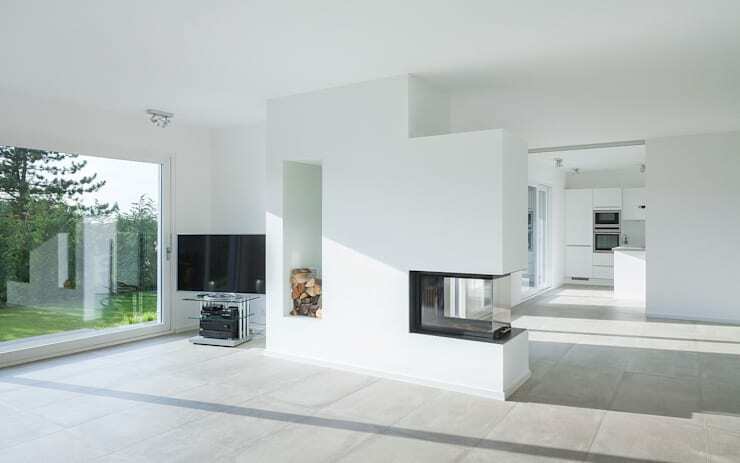 The fireplace creates a divider between the two living spaces and also serves to warm both sides of the room too! 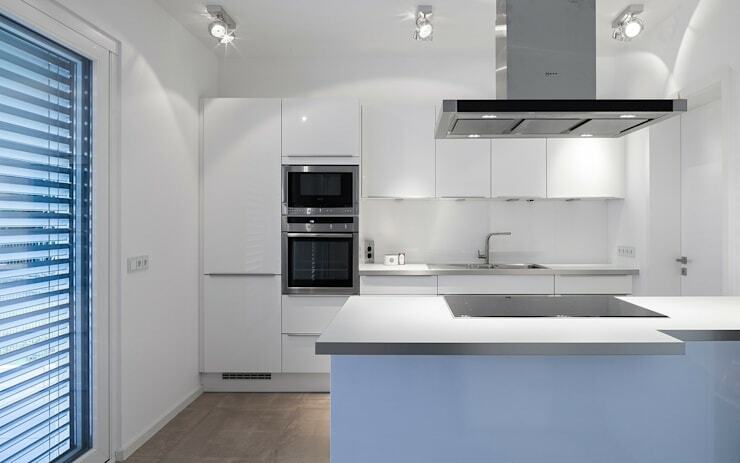 This magnificent kitchen has all the classic style taste of the perfect gourmet cooking space, even if cooking is not your thing, you will definitely want to get started in taking full advantage of all the modern appliances that this beautiful and sleek kitchen has to offer. So even if you are a complete culinary novice and your skills are basic and beyond, you may want to enrol in cooking classes to be able to master the stove and knife like a pro. You may have potential to be great at it! It's definitely worth a try, even if you do end up with some butter burns in the process, think of them as war scars and get cooking with this kitchen! If you are seriously about mastering the culinary art of cooking and baking, then here are some fun gourmet kitchen ideas: A Good Cook Needs A Gourmet Kitchen. This stunning bathroom of the ultra-cool cube home shares the same traits as the rest of the interior and exterior space, with neutral tones and all-white walls and cabinets creating refined yet luxury look and feel to the home space. While the bathroom has an abundance of lights included on the ceiling allowing lights to shine in every direction. 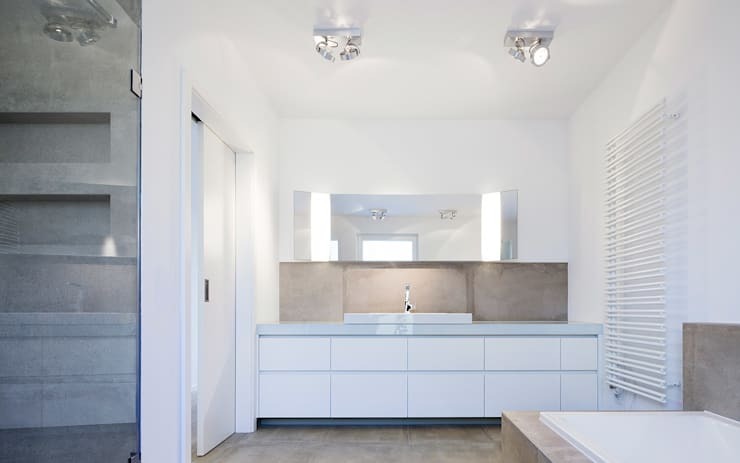 The bathroom is another look at how sleek and modern this designer home is, with stone coloured tiles included on the flooring and bath tub as well as splashback at the basin. This bathroom also has enough for storage for towels, bathroom essentials and even cleaning supplies for the perfect uncluttered look within a home. If you liked this modern and designer bathroom option, have a look at these bathroom ideas created by professionals and showcased on homify! The back exterior of this fantastic modern home is not any less of a stunner than the front, in fact from this perspective we get a clear view of the amount of lights featured so famously on the exterior wall of the home, while the inclusion of so many windows is evident that this home has a sense of wonder and fabulous appeal regardless of the time of day. The windows allows for natural sunlight to shine in throughout the day, making it relaxed and comfortable yet wonderfully illuminated, while at twilight this house has an almost different appeal. 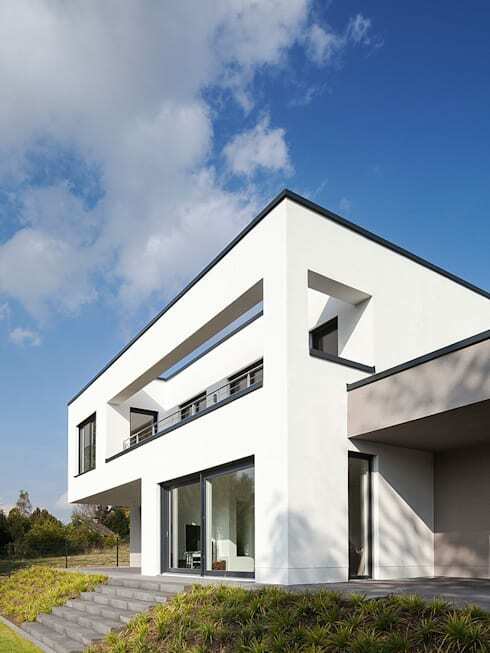 From this angle you can clearly appreciate the contrast in style of the all-white walls and black frames of the roof and windows… truly elegant! Are you a fan of minimal design? if not, did this home help persuade you? Let us know your thoughts!